Huddersfield Town held off Championship leaders Cardiff City with a gritty display at the John Smith's Stadium. Despite the stalemate, Cardiff stretched their lead to 11 points after Leicester City were beaten 2-1 at bottom side Peterborough United. James Vaughan did have the ball in the net for the Terriers but Cardiff keeper David Marshall had been fouled. 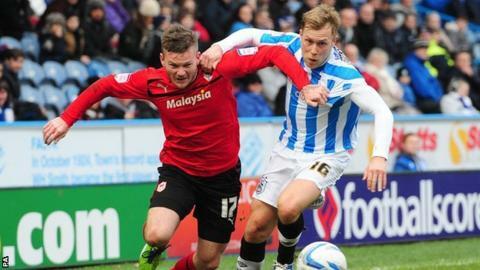 Defender Matthew Connolly had Cardiff's best chance when he hit the post in first-half stoppage time. It was only the second time in eight league games that Cardiff had dropped points, but managerless Huddersfield deserved their share of the spoils. Joint Huddersfield caretaker managers Mark Lillis and Steve Eyre were able to name central defender Joel Lynch for his first start since New Year's Day, while striker Sean Scannell was recalled. Cardiff boss Malky Mackay made minimal changes, with Kevin McNaughton replacing Ben Turner at right-back. Neither side produced a shot on goal in a cagey opening quarter of an hour before Huddersfield striker Vaughan headed wide from six yards. Cardiff defender Mark Hudson was off target with a header from similar distance at the other end and home midfielder Oliver Norwood fired a 25-yard free-kick over the crossbar. Huddersfield took the game to the leaders and had a goal disallowed midway through the first half when Vaughan hooked the ball home from a corner, only for referee Mark Brown to rule Cardiff goalkeeper Marshall had been fouled. The visitors enjoyed their best spell as half-time approached and Huddersfield goalkeeper Alex Smithies, captain for the day in the absence of Peter Clarke, was forced into a full-length save to turn away Craig Bellamy's 25-yard free-kick. Cardiff almost snatched the lead in time added on at the end of the first half when centre-half Connolly crashed a shot from the right edge of the penalty area against the post. The Welshmen were then dealt an injury blow as McNaughton required medical treatment after a heavy challenge and he was replaced during the interval by Ben Nugent. Cardiff began to get on top early in the second period and Bellamy fired an angled left-footed shot just wide in the 60th minute. Smithies then fumbled an effort from Craig Conway and Nugent headed the subsequent corner the wrong side of the post as Huddersfield were forced on to the back foot. Bellamy smashed a free-kick from the edge of the area into the wall with three minutes remaining to end a frustrating afternoon for the Welshmen, while Huddersfield were given a standing ovation by the majority of a 15,265-strong crowd. Huddersfield caretaker manager Mark Lillis: "We had 11 captains out there and I am massively proud. "It was an important point and that's two clean sheets against two top four sides now - Cardiff and Crystal Palace. "The players have showed great spirit, endeavour and passion and that's what a manager wants to see." Cardiff manager Malky Mackay: "It's another point gained for us. We were playing against a team that is now unbeaten in six at home and they are playing for their management. "They had a five-man midfield with 10 men defending the final third but we have to get used to that. "I will always take 0-0 away from home. It keeps us undefeated in a difficult division. "It was a very tricky pitch, one of the poorest we have played on but it was the same for both teams."